Jane Vaux is an Artist based in Oxfordshire who started her professional art career down on the coast of Devon. She has had a website for a number of years, including an online gallery and the ability to sell her artwork directly through the website. However, Jane came to us with a problem. Her website was not performing at its best as it was not mobile friendly and her online shop was built on a different platform to the rest of her website. 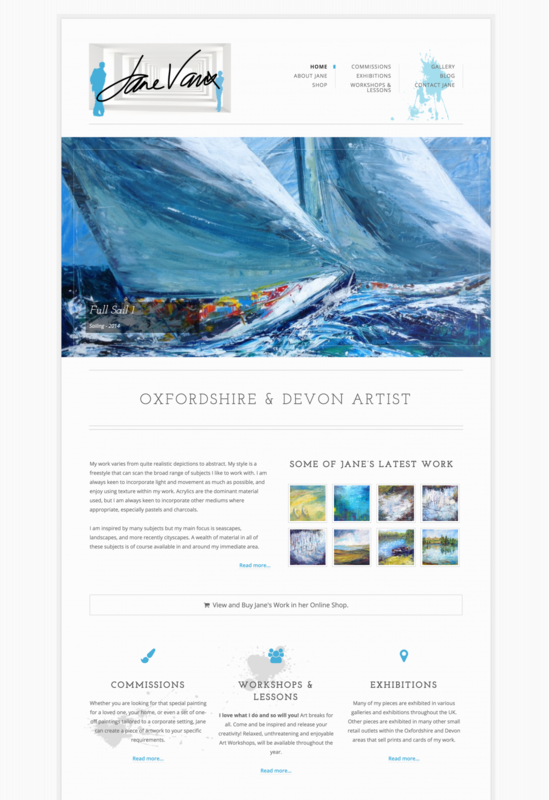 Our solution for Jane was to build her a whole new mobile-responsive website that gave her one central point to manage her website marketing pages, her gallery, and her online shop. We also looked at the user experience throughout the site. Redesigning both parts of her site allowed us to make her new website much more fluid for a user. There is now no conflict between the design of the online shop and the rest of the site, and as a user browses through the website there are plenty of prompts encouraging people to look further through the products available on her website.